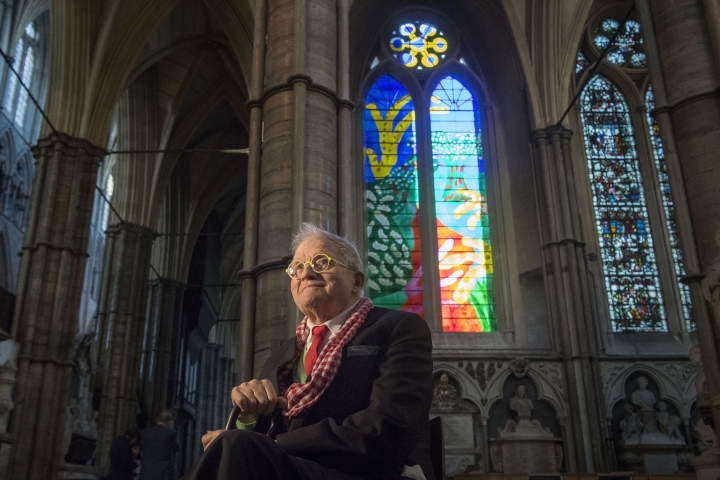 LONDON — A stained glass window by artist David Hockney, based on a design he sketched on an iPad, was unveiled Wednesday amid the marble and monuments of London's ancient Westminster Abbey. The Queen's Window was commissioned to celebrate the long reign of Queen Elizabeth II and depicts a landscape of blossoming hawthorn trees in hues of blue, green, yellow, orange, pink and red. The 81-year-old British artist, known for his depictions of sun-dappled Los Angeles swimming pools and wooded English hills, took inspiration from the monarch's love of the countryside and the landscape of his native county of Yorkshire. The window above the abbey's north transept is a strikingly modern addition to the building where British monarchs have been crowned and buried for more than 1,000 years. "I didn't want a figurative or heraldic thing at all," said Dean of Westminster John Hall, who dismissed some of the older stained glass windows in the abbey as "vulgar" and "ghastly." 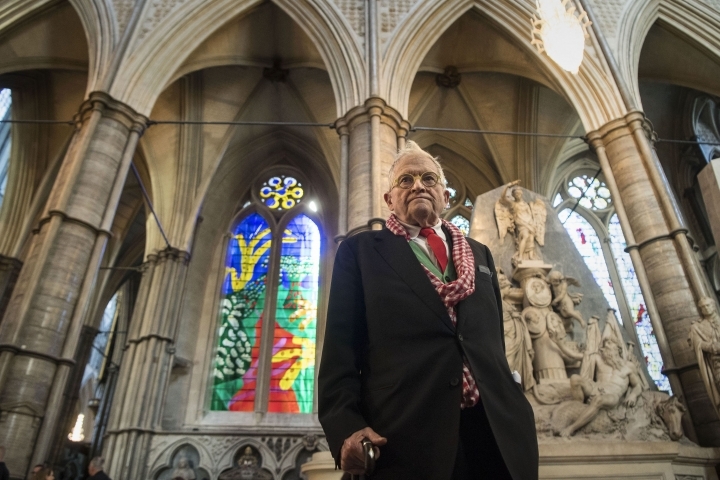 Hall approached Hockney because he is "the most celebrated artist alive" and a British national treasure who has been named by the queen a Companion of Honour, an award limited to 65 distinguished people. "He told me he couldn't do it for six months because he was busy," Hall said. "He sent me a sketch the next day." Glass artist Helen Whittaker, who worked on the window, said she hoped it would make people realize that stained glass is much more than just "religious wallpaper." "Stained glass has always been seen as a lesser art in the art world, so for him to put it on the map as a 21st-century art is a real plus for our profession," Whittaker said. It's a new medium for Hockney, who in a seven-decade career has embraced drawing, painting, printmaking, photo collage and video. Based in Los Angeles, he is arguably the world's greatest living artist, and is certainly one of the most prized. One of his LA pool paintings is being auctioned by Christie's in November, with a pre-sale estimate of $80 million. "I'm still smoking," he told a well-wisher at the abbey on Wednesday. "I'm still living."